Fan favorite, Ladik Joe Ermis joins me once again for this week’s episode. I know I’ve said this a million times but I’m super grateful for my peers, like Joe, who are so willing to come on the show on short notice and help me answer your questions. Joe is also known as the IPA guy around here and he’s the man behind the recipe that my dad and I brewed for our first all-grain brew day so I was glad to update him on the success of how that beer turned out! Today’s show is brought to you by Kegconnection.com! 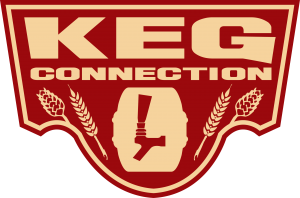 Check out Kegconnection’s brand new “Brewer’s Club Rewards” program which gives you points for every purchase and the ability to earn FREE points simply by sharing content or participating in various activities. You can redeem your points for discounts on future orders, FREE SHIPPING, FREE GIFTS, and a whole lot more so go to Kegconnection.com for more information. Homebrew Happy Hour listeners who shop at Kegconnection.com can use the promo code “HHH” to receive 5% off your order. Hey hey hey, it’s another episode of the Homebrew Happy Hour! Thank you for joining us once again for the Homebrew Happy Hour show! I’d like to start this week’s show, again, by THANKING you all for the tremendous amount of love you’ve sent Todd’s way. Our email inbox, Facebook inbox, Instagram inbox, and YouTube comments have been full of your support and words of encouragement and condolences for Todd and Liz regarding the recent loss of their son and we all thank you from the bottom of our hearts. You guys are truly the best community we could ever ask for and we can’t thank you enough for that. Thank you for joining us on the Homebrew Happy Hour! We are truly appreciative that you’re here and it blows our mind how fast our audience is growing. THANK YOU, THANK YOU, THANK YOU for all the love and support you’ve been showing us. On that note, I selfishly ask that you please send love and support to our own Todd Burns. Shortly before he was scheduled to fly out of the country for a business trip with James to Germany, he got a phone call that no parent should ever receive. Todd and Liz’s son, their oldest child, Kyle, had passed away unexpectedly late Monday evening. Todd and Liz have been like parents to me over the past decade and we’re all so heart broken over the loss of Kyle. Obviously, Todd wasn’t able to join this week’s episode and, honestly, I’m not sure when he’ll be back but please keep him and his entire family in your prayers. Kyle left behind a ton of people who loved him dearly and we’re going to miss him so much. It’s super hard for me to segue from something so heavy and serious (because I’m an awkward dude) but we do have a great show lined up for you this week. Ladik Joe Ermis from Homebrew Supply joined me and helped answer your questions. We address a homebrewer who already brews small 1 gallon batches but is looking to scale up to 2.5 gallons and wants to know the best way to do so. 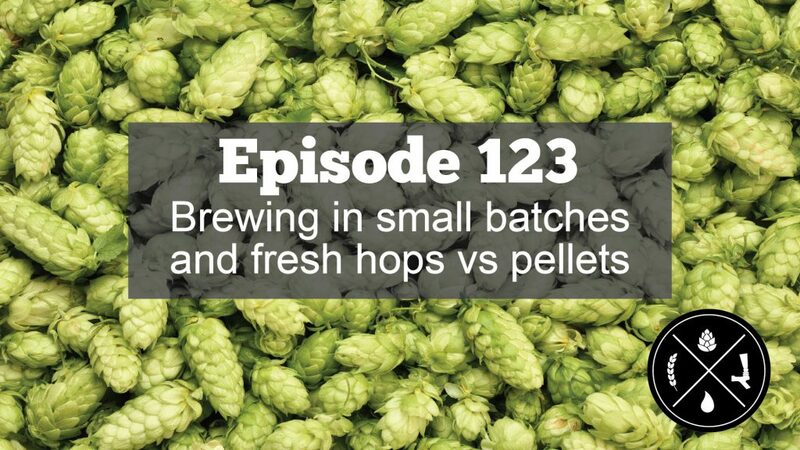 We also take a voicemail question asking about fresh hops versus pellet hops. I can’t tell you how appreciative I am that Joe was able to join me so last minute! I really think you’re going to enjoy this episode. It’s another week and another episode of our homebrew podcast! Thank you for joining us on the Homebrew Happy Hour! One consistent feedback that we receive here is that many listeners wished we produced our show more frequently than just once per week. I can’t tell you enough how flattering that is and how much we truly appreciate you listening/watching AND, apparently, enjoying the show. It boggles my mind! Todd is out sick with some sort of terrible cold so James joins me to discuss your homebrewing-related questions. Specifically, we discuss a question from a listener who transferred beer from one pin lock corny keg to a different ball lock corny keg and, mysteriously, it caused his beer to go completely flat! 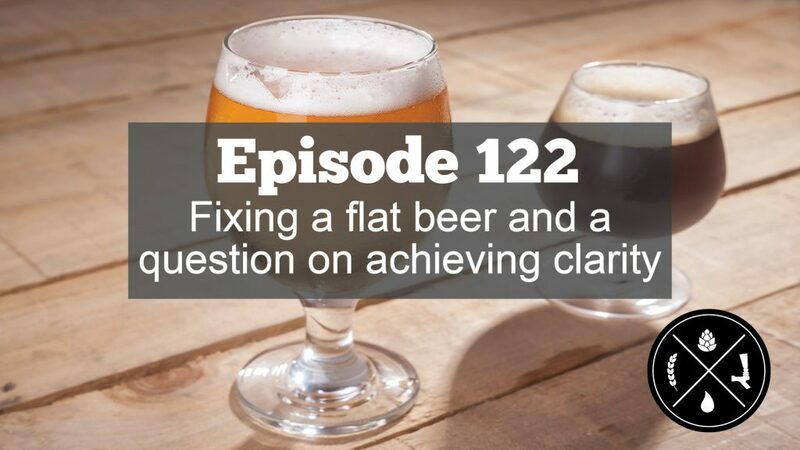 We also address a question about achieving clarity with your beer. Literally, making a clear beer – not some mental enlightenment achievement or something, although maybe we could address that too on a future episode? 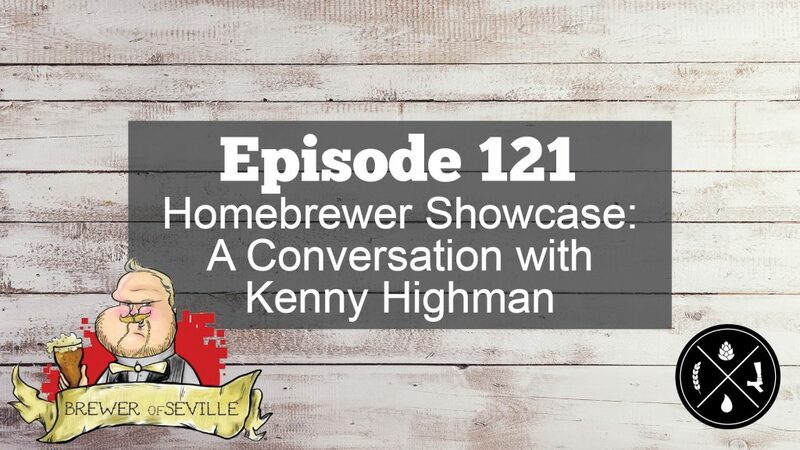 I’d like to start this episode with praising today’s guest, Kenny Highman from “The Brewer of Seville“, for being an awesome interviewee and also a saint of patience! In case you didn’t already know, we record this show earlier in the week and then after some touching up (i.e- automated audio processing to make us sound better than we really should), we then publish the show. In the 121 episodes of just this show that I’ve produced, we’ve maybe had bad enough technical difficulties or one of us will flub bad enough that we have to stop recording and fix the issue. I never (and I mean NEVER) really even bring that up with guests but before recording today’s show I happened to mention to Kenny that “in case we flub, we can stop and fix the issue. no worries because it NEVER happens!”… my subtle smugness would prove to be my downfall because poor Kenny had to hang out with me for over an hour just to produce the content for today’s show! The good news is that Kenny is a blast to hang out with and I am super happy that I got to know him better even thru all my technical difficulties and flubs. 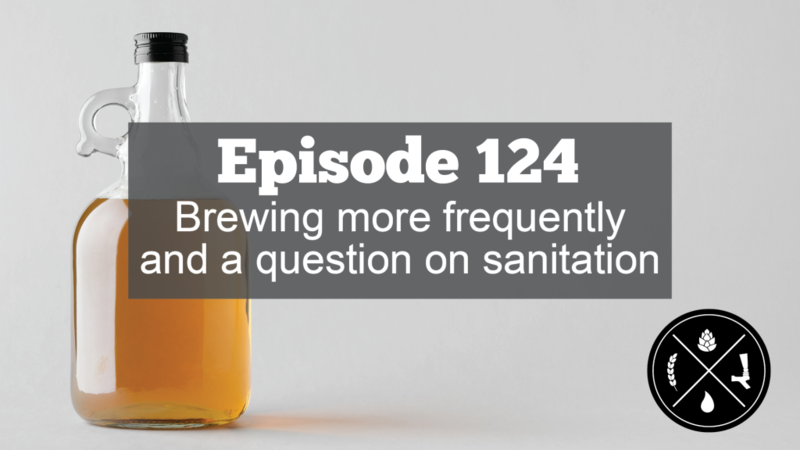 Kenny, also know as The Brewer of Seville, joins me to talk about his homebrewing journey. This is another edition of our “Homebrewer Showcase” and the more I produce these episodes, the more I’m really enjoying them. 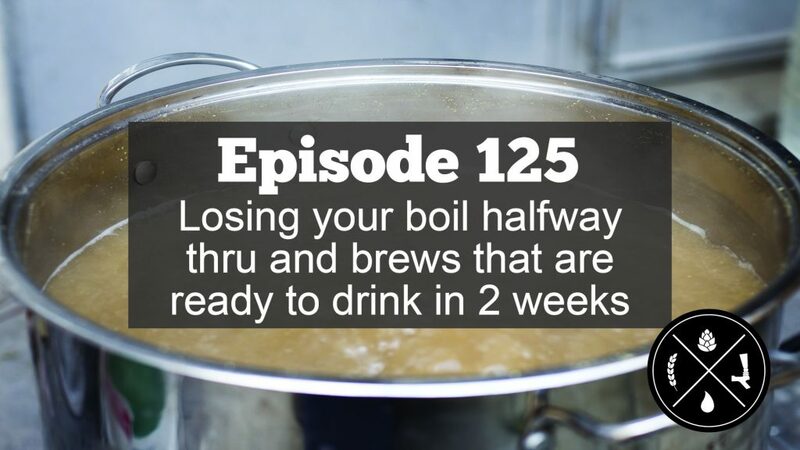 Kenny hasn’t been homebrewing for a very long time but you can tell throughout this episode that he’s zealous for the craft and it’s exciting to see what he’s doing. I am confident that you’re going to enjoy this podcast episode!